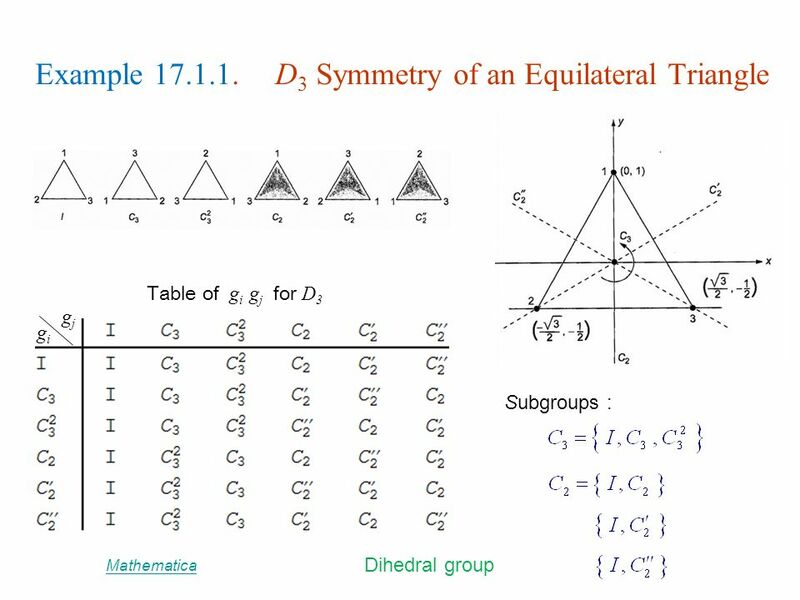 A rather technical subject today, but symmetries and group theory are possibly the two most fundamental aspects of modern day theoretical physics. Everything starts with symmetry algebras. The concept of symmetry is a simple one, familiar to all of us. We can very quickly notice if something is asymmetric, a lack of symmetry often ruins the appeal of an object. In general, the symmetries which we encounter in physics are very intuitive ones. We have mirror symmetry, rotational symmetry, temporal symmetry and symmetry under boosts. You can probably guess what most of these are. Symmetry may be very familiar and intuitive to us, but how can we talk about symmetry mathematically? We know that triangles and spheres both possess kinds of symmetry, but how are they related? The mathematics of symmetry can be described by “Group Theory”. Group Theory is rather simple really. We just have a collection of objects “a,b,c,d” for example and then we define multiplication rules for each pair of these objects. For example we can declare that “a x b = c” or that “d x a = b”. There a just a few rules that we have to abide by for this system of rules to be called a “Group”. There must be one object called “e” such that if you multiply anything by “e”, you get the same object back. Because of this “e” is often denoted “1” or called the “identity element”, or I. Indeed the everyday real numbers (except for zero) form a group and their identity element is 1. This all seems fairly abstract at the moment, how does this relate to symmetry at all? Well we’re actually ready to describe the symmetries of an equilateral triangle just with the above. We define a symmetry as an “operation that leaves an object unchanged”. Take an equilateral triangle for instance and ask “what can we do that will leave the triangle looking the same?” The picture below illustrates all the operations we can perform on a triangle that leaves it looking the same. Now we give each of these operations a name. These operations then form a group called “the Dihedral Group” which is the group of symmetries of the equilateral triangle. We can call the bottom right triangle the identity element “e”, because rotating by 360 degrees will not change the numbering of the corners. The other operations all change the numbering of the corners. We can use this to work out all the multiplication rules for our group! For example if rotating by 120 degrees is called “a” and rotating by 240 degrees is called “b” then it can easily be seen that “a x b = e” because rotating by 120 degrees and then by 240 is the same as just rotating by 360 degrees. We can use the same methods to find the symmetry groups for all kinds of shapes and objects. But what about objects that have an infinite number of symmetries? Like a circle or a sphere? We can still describe their symmetries using group theory, but the group now has to contain an infinite number of elements. The “α” parameter is just the number of degrees of rotation and can take any value, so we have our infinite set of group elements. It’s difficult to analyse an infinite collection of matrices however. A better way of analysing infinite group such as SO(2) is to look at their “Lie algebra” instead of their group elements. The Lie algebra also has an infinite number of elements, but what is particularly interesting is that we always have a finite number of elements in the Lie algebra (called generators) which, predictably, generate the entire Lie algebra. It’s a bit more interesting to work in three dimensions now, so we’ll look at SO(3) which is the group of symmetries of the sphere as opposed to the circle. The Lie algebra for SO(3) is given by the set of traceless, 3×3, antisymmetric matrices. As I’ve said, this is not the interesting fact, what is interesting is if we look at the generators of this set of matrices. Which may not mean a lot to you, but this has huge significance to physics. You see, these three matrices also happen to be the matrices which represent angular momentum, or the spin of a quantum particle, along the x,y and z axes in quantum mechanics. So now we have a very profound link between symmetry and physics which recurs constantly. Rotational symmetry is generated by angular momentum, translational symmetry is generated by momentum, temporal symmetry is generated by energy. The question modern theoretical physics tries to answer is whether there are any more correspondences between symmetry and physical quantities in nature. One such theoretical proposal is known as supersymmetry. Supersymmetry predicts that there is an additional symmetry between the two different types of fundamental particle – fermions and bosons. It seems strange that nature has such a random collection of fundamental particles, so physicists are investigating whether there are hidden symmetries between them. A symmetry between the different kinds of particles would be generated by a “supercharge”. Sadly the lack of new findings at the Large Hadron Collider may be an indicator that supersymmetry is not actually realised in nature. There are certainly kinds of supersymmetric theories that have now been ruled out. This may be a lesson that we mustn’t take mathematical elegance too far and let it dictate our physics. Nevertheless symmetries and generators of symmetries are certainly important to physics and give remarkable insights into the way the world works.